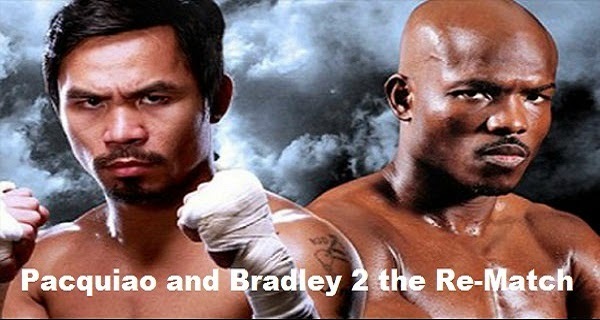 Every fan is excited over the bout of two of the most dangerous boxers in the world, Manny Pacquiao and Timothy Bradley. It will be a rematch on the welterweight world title on Saturday in Las Vegas. While the event is getting nearer, there are statements coming from both fighters on what to expect during the game on Saturday. Timothy Bradley said that he needs to knockout Pacquiao. We remember that in June 2012, the belt was taken away by the California’s “desert storm” from Pacquiao that got into lots of controversies as the fans and boxing analysts were not convinced that Bradley won. On the other hand, Recah Trinidad, a sports columnist expects a good match between the two and according to him, Pacquiao will win the fight either by knockout or by points. He believes that Bradley doesn’t have the capacity to knockout Pacquio despite his condition. He is expecting that Pacquiao will gain back the belt that was lost and handed to Bradley for almost two years. Timothy Bradley and Manny Pacquio have already stepped on the scale for weighing. During the event, almost 90% of the crowds were cheering for Pacquiao. These crowds have shown different ways on how to show their support to their idol. Some even brought Philippine flag on which the fighter represents. 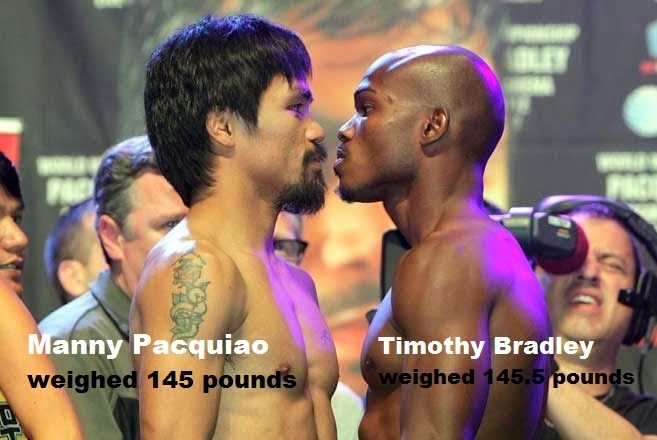 The weight generated heat for the two fighters who weighed 145 pounds for Pacquiao and 145.5 pounds for Bradley. Both of them were qualified for the game due to the fact that they have reached the weight limit. Bradley said that he is going to beat Pacquiao because he is already on the down slope of his career who has already 60 games and started in 1995. He even stressed the fact that it’s too late for Pacquaio to do something about it because he has been at the top for so long and his motivation is not there. Pacquiao’s coach, Freddie Roach said that Manny is dedicated to win the fight. He knows Bradley as a boxer with the heart and he is better now but it is not enough to beat Pacman because Manny has a plan to beat him again. And he even said that this time it is for real. During Bradley’s fight with Marquez, he has shown solid punches and style but Roach said that things will be different when he will fight Pacquiao for he will surely go back to his street fighting style when he fought Pvodnikov.